We got up by 5:30am and breakfast by 6am. The weather hadn’t improved and if anything it was windier than originally expected. 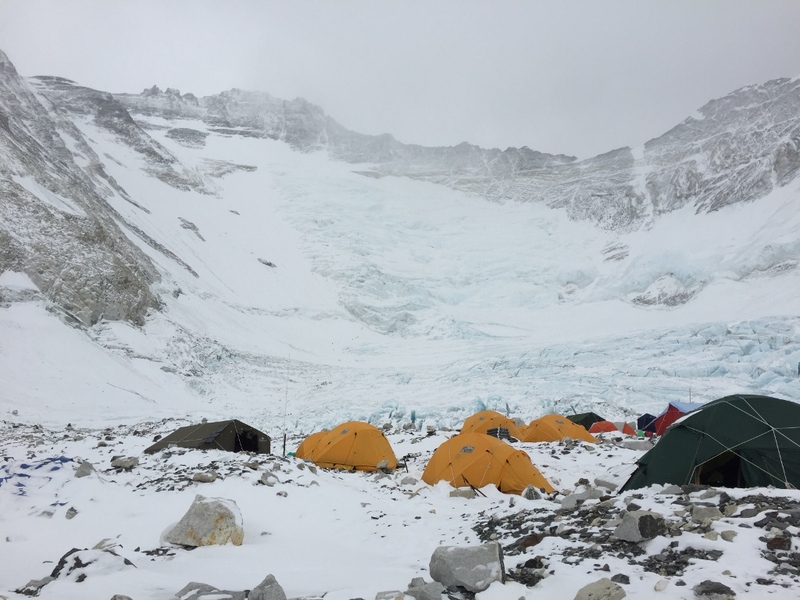 By 6:15am our Sherpa’s working on the ropes at Camp 3 radio’s us and told us it had snowed so heavily the night before that all the ropes were covered by snow and that potentially climbing through them could trigger avalanches. My favorite word! 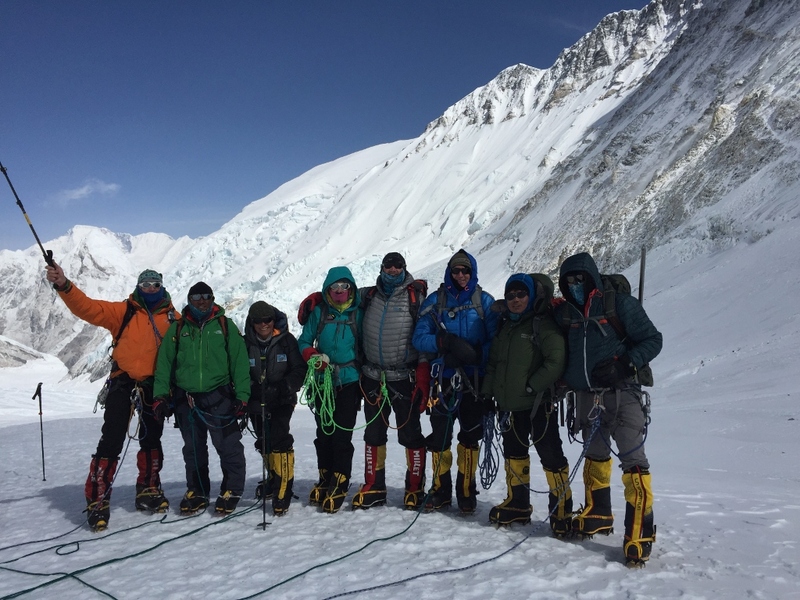 Mike, Dorjee and Lydia agreed that we wouldn’t attempt Camp 3 but instead walk up to the beginning of the Lhotse wall and return back. 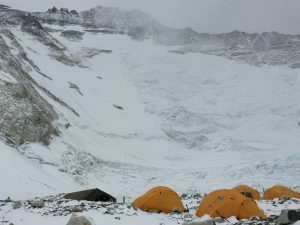 The end of Camp 2 is surrounded by Everest and by Lhotse. In order to keep climbing further up, the route has been set up by placing ropes through a steep side of Mt. Lhotse, hence the name – Lhotse Wall. 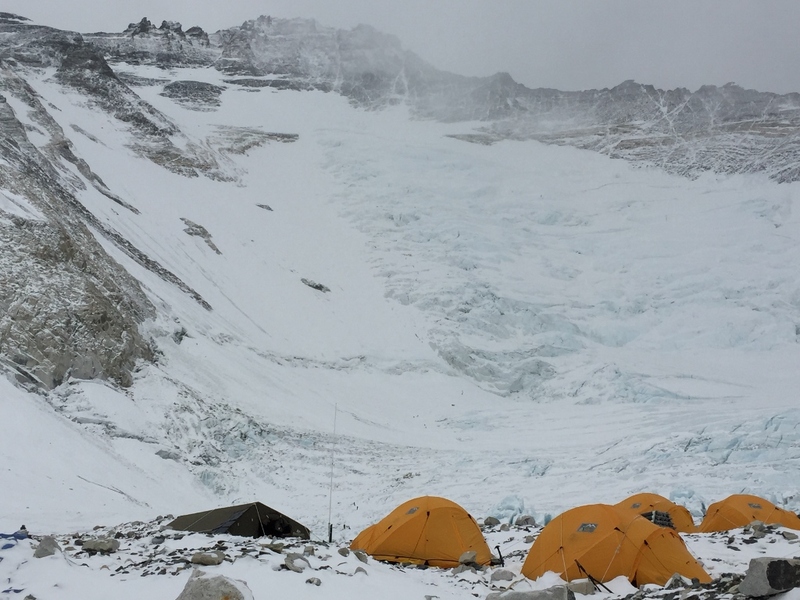 This structure shined from afar, full of big blocks of ice, extremely imposing, commanding such presence yet scary when seeing how high we’ll have to climb to make it to camp 3. As we started our incline walk, this route was so different with all the snow that had fallen from my last week visit. 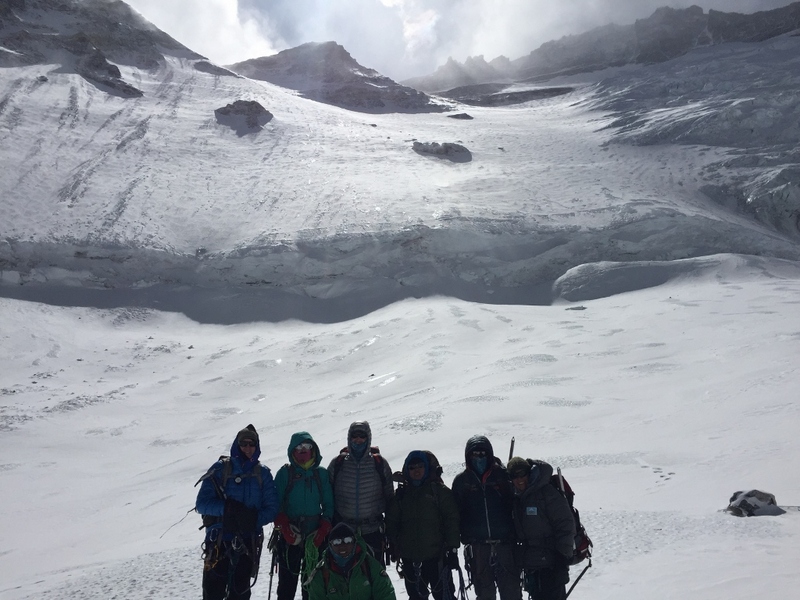 We all kept a pretty fast pace and within an hour were close to the base of the Lhotse Wall. Seeing the route that I’d potentially would be climbing tomorrow gave me goose bumps. Not easy at all, more inclined that what I’d had thought. A couple of group pictures and some hydration and food was our reward. I’m the shortest in the whole group! Though as we were resting, other Sherpa’s came our way. Due to the ongoing set up work they needed to make for other camps, they were not in the position of skipping a day but instead would have to risk and climb up to Camp 3. On the positive side, they are more experienced climbers that us, hence it’d be ok for them to tackle snow-covered ropes and be alert to any potential avalanche danger. 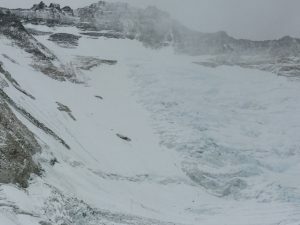 As we returned to Camp 2, the weather turned for the worst and the conditions were quite miserable. Extremely cold, I was wearing all my summit gear and I was still battling my cold nose. This time Mike gave me a NyQuil, hopefully this would do the trick. During dinner Mike told us that the weather would be “normal” (standard freezing cold without winds or storms) – hence we would be attempting our climb to Camp 3. 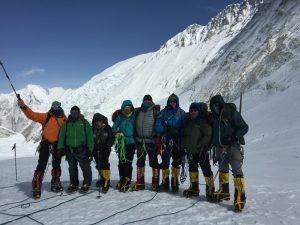 The biggest reward was that once we would complete our climb to Camp 3, then we’d depart down to Base Camp the following day and rest until a long summit window would open for us. As my nose was getting worse, getting back to Base Camp was a great incentive. With NyQuil as my bed partner and hoping this would miraculous cure my cold. Surprisingly, the storm we felt during the afternoon and evening stopped through the rest of the night. Nervous jitters as it seemed we were going to be going up to Camp 3. Though a good meditation session was enough to take my anxiety away. We’ll see what the adventure leads up to tomorrow. Treat of the day: NyQuil – so good for sleeping!!! !